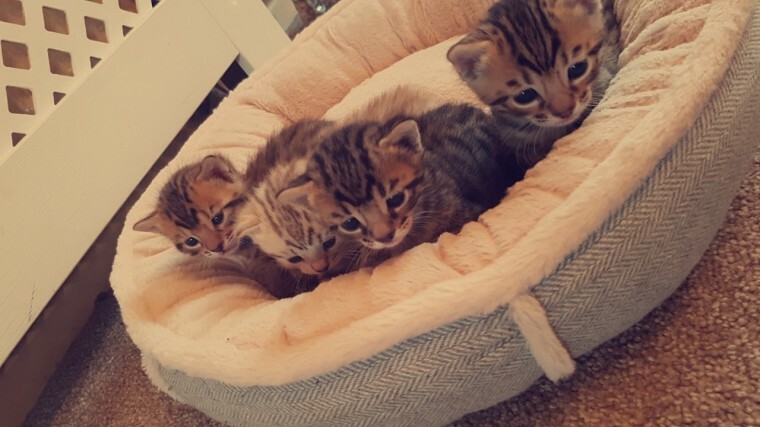 Beautiful Bengal kittens litter of 4 Boy 1 brown spotted 500 Boy 2 brown spotted 500 Girl 1 snow spotted 600 Girl 2 brown spotted 500 Beautiful markings of spots & stripes Kittens are raised in my loving home with children, pets and household noises so they will be confident with these when leaving. They will be fed whiskas kitten wet and dry food aswel as a bit of raw meat (chicken, fish, beef..) to provide vitamins and minerals needed, healthy shiny coat along with other health benefits for the best start in life! All kittens have been vet health checked & will be flead, wormed, ear drops, fully weaned & litter trained before leaving. Mum & dad can be seen Mum is snow/brown spotted Dad is brown spotted Viewings welcome now!! If you are interested in giving one of my beautiful little leopards a loving home or have any questions please contact me to arrange a viewing! Ready to leave 1st May!